Many of our caregivers have known Yvette and work at her agency. 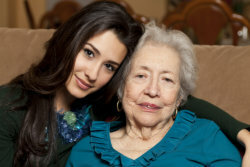 They know her and she is aware of their excellent caregiver skills and record of accomplishment. Although as growth requires we do have new hires that come on board and they are fully screened, tested, orientated and trained to ensure their intentions and excellence meets Above and Beyond Caregiving, Inc. standards for delivering personal care services. Once qualified and approved for employment, they are entered into an amazing software system called HomeTrak that allows us to pick the best candidate for each client based on skills, personality, location, and availability. We ensure that the caregivers we select have the training and experiences needed for the assignment, and are suitable for the job. Our normal protocol is to introduce our caregiver first, before the schedule starts, so you can have the opportunity to meet, interview, and interact prior to acceptance. If for any reason you are not satisfied, we will correct the situation at any time as requested. Our caregivers will have an experience and/or knowledge of their assigned client’s condition(s) and/or diseases prior to the introduction along with all the job requirements, so they can prepare and be ready to work proficiently. Will be employees of Above and Beyond Caregiving, Inc.
Will have their taxes paid by Above and Beyond Caregiving, Inc.